Sometimes brand names will design knickknacks specifically for the average girl in mind, which is the case for all of the following toys for ten-year olds in 2014. While they’ve been on the market for a handful of months, the short-list of toys to follow are highly anticipated to soar above the usual popularity, and have gained fame and momentum throughout October and November of 2013. These gadgets and playthings have been created with girly-girls and tomboys in mind, inspiring those young women to chase their imaginations with strength, vigor, and artistry. You’ll find your cutie’s mind has developed a new tenacity for creation and imagination from just a few hours of playing with these upcoming baubles. They ARE that amazing! The phrase, “You fight like a girl,” has taken on a whole new meaning! 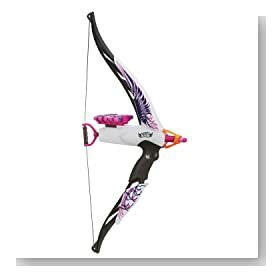 This blaster bow from Nerf turns your miniature sweetheart into a fierce heartbreaker with a power-punch of 5 collectable arrows (made from foam). The design is all girly-girl with purple and pink woven designs, and there’s a firepower of up to 75-feet per shot. The sight is adjustable, a removable storage compartment for darts is convenient, and your cutie can rest assured that she’s the baddest little-lady in the backyard. As the advertisement suggests, it’s time for young women to step up and stand out! When I was a little girl, there was nothing quite like baking sweet-treats for my Mom and Dad – although, I’m sure I burnt several homemade meals and they smiled, nodded, and said it was delicious (the awesomeness of having great parents). But I also burned myself on a regular basis. However, that’s something the modern generation won’t have to worry over! This revamped oven includes a safer, more secure method of baking, without those pesky, too-hot light-bulbs that powered versions of the 80s. It’s an instant peace of mind, and a way for cuties to come up with their own scrumptious confections – safely! This beautiful doll is a collector’s item for Barbie fanatics everywhere! She’s glitzy and glamorous in a holiday dress of silken satin and silver glitter. 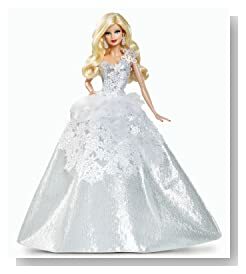 Her gown is delicately ruffled and flowered with tulle accents, and Barbie’s best features (her beautiful face and hair) are prominently displayed with dazzling diamonds. She’s also equipped with her signature smirk, an alluring expression, and delicate, life-like hands! Toys for girls who are the age of about ten are probably not referred to as “toys” by this age. Instead, tweens will likely prefer the actual name of their playthings than the word “toy” – a word that could possibly bring them down a notch or two and remind their hormonal brains that they’re still children. Oh, what a fun age… sometimes! With their blossoming minds and chaotic, ever-changing emotions, I’ve pinpointed 3 toys that I think (based on personal experience) would be the greatest for kiddos of this crucial age. Each of the following 3 among the best toys for ten year old girls is a learning experience – not ones in the classroom, but rather ones that little ladies can remember fondly throughout their childhood. Helping my mom and dad bake in the kitchen was one of the many amazing highlights of my childhood – as it should be for other youngsters. The experience is one of learning, uncomplicated fun, and bonding with family. And Easy-Bake ovens were awesome for this, as well! 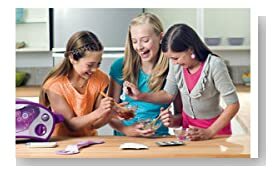 Now revamped for safer baking, the Easy-Bake oven included a mix of cookie batters, cake blends, and general confectionary treats to cook, decorate, and serve. Little ladies (and gents) can feel happy and accomplished while creating something for their friends or family. This version of the ever-stylish Barbie is edgy and awesome! You’ve likely never seen anything like it. Her shoes are light-up and translucent, giving her a neon vibe with a walking-on-air attitude. For the digital age, this Barbie has gone techno in her fashion advances. Wearing a tech-savvy dress, kiddos can change the patterns and designs by choosing different modes with their stylus – right on Barbie’s gown. Some of the designs are pre-loaded, but there’s also a mode where kids can use their fingers to draw on the dress, creating their own patterns for a proud, fashionable Barbie model. 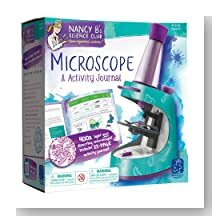 Hands-on and perfect for your scientific cutie, this microscope and journal activity set is more exciting than any club your little lady could join. For at-home or on-the-go use, the magnification can reach new heights of 400x or down to 30x with a few well-placed specimen slides. There’s also a 22-page journal that kids can use to record their scientific findings – and that also includes several pages of science-based activities and project suggestions.